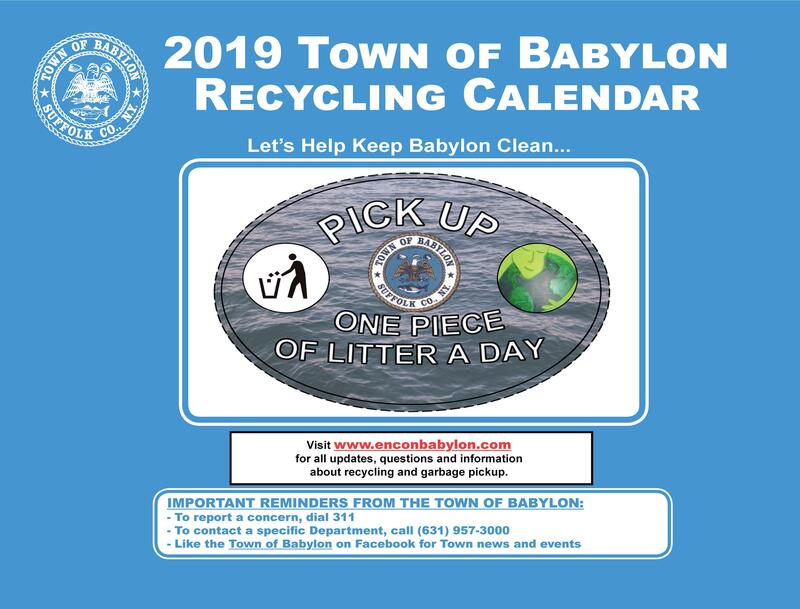 The Town of Babylon's 2019 Recycling Calendar is now available! Inside you will find everything you need to know regarding recycling information and garbage pick-up, as well as news from around the Town. The 2019 calendar has been delivered to residents. If you did not receive one in the mail, click the calendar above for an electronic version or stop by Town Hall between 9:00 A.M. and 4:30 P.M. Monday-Friday for a physical copy. For questions regarding pickup, please call EnCon at (631) 491-3200, or visit their website at http://www.enconbabylon.com/. Pick-up of bottles and cans alternates every Wednesday with pick-up of papers, except during holiday weeks when they will be picked up on your regular garbage day (Thursday or Friday). E-Waste is no longer picked up curbside. Electronics can be dropped off at the Residential Recycling Facility in West Babylon or returned to place of sale. Arrangements for special pick-up can also be made. Residents should also explore online reimbursement programs for unwanted electronics. Natural Christmas Trees will be picked up on the same days as your yard waste. Please use only standard 33 gallon pails with lids, molded handles and no tie-down straps. No material can be above the top of the can. This helps your garbage collectors avoid injury. Never use plastic bags to package newspaper at the curb. Always tie up newspaper with twine before putting it out for collection. Keep your garbage collectors safe and your streets clean by never putting liquid paints out to the curb. Paint cans that get crushed in the back of trucks often spew paint. Recyclable cardboard can become easily contaminated by grease and food remnants (i.e. a pizza box). If your cardboard is contaminated, please put it out for regular pickup. Not sure if an item at your curb is too large to be picked up or if your yard waste isn't bundled properly? Visit www.enconbabylon.com or call 491-3200. 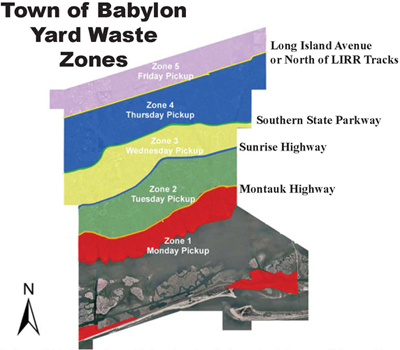 Over the past three years, the Town of Babylon's new yard waste zone pick-up system has saved countless miles of fuel while also increasing the safety and efficiency of the pickup process.Your Yard Waste Zone (YWZ) is determined by the area of Town in which you live. To find out which zone you live in, please see below or call (631) 491-3200.